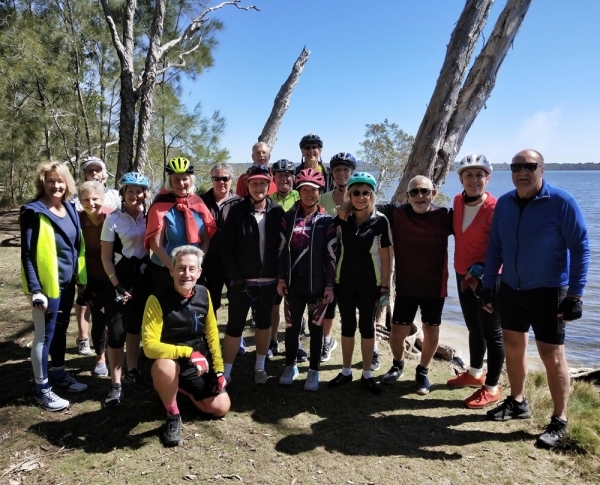 Join Carol, Jillie, and friends for a couple of hours of easy social riding, mainly on picturesque bike paths, with a coffee stop somewhere in the area of the ride. A ride on mainly flat bike tracks. Each trip is about 25km to 30km round trip. Average speed is 16kph. There are some beautiful bike paths on the Sunshine Coast and we try to keep things interesting by taking a different route each week. Keep an eye on this site for a possible change of assembly point or start time. You can also add your name to Who's Going and we will email you any changes. Please try to arrive at least 10 minutes early so we can get away at the scheduled time. The group push off at the scheduled time. There is NO need to contact the ride leader if you cannot make it on a particular week. For further details, please contact Peter or just add your name to Who's Going and come along for the ride. Good morning and happy Easter to you all. For any of you who don't have commitments for Monday, I thought it would be nice to have a ride and a bit of social banter together. Meet at Jessica Park at 7.30 and we'll do a nice ride and find a coffee spot. Coffee at Peregian Springs pool cafe. Hopefully the sun will be shining brightly. I will lead and we'll have coffee at the hospital coffee shops after a cruise into the forest and surrounds. David has asked me to send this message regarding tomorrow's ride. If it continues to be wet we will meet for breakfast at 8am at the Coffee Club, Mooloolaba for our usual social catch up. Next Monday's ride (25th March) will start from Birrahl Park, Yaroomba at 8.00am. Meet at the end of Warragah Parade. PLEASE NOTE, this ride will commence at 8.00am. We will ride north through Coolum Beach to Peregian Beach where we will have our coffee stop. Hello all : details for our ride on Monday 18th March. Diane will lead us and meet at Trader Dukes' now called the Bridge Hotel, Maroochydore for a 7am get away. An easy ride to have coffee at Curly's. Your ride for next Monday 11th March will be led by Brian. (The planned leader for next Monday had to drop out, so I have offered to fill in. To make it easier, we will do a similar ride with a few changes from my ride in early February). Leave near Maroochy Bridge Hotel (I think this used to be called Traders Duke Hotel), 22 Denna Street Maroochydore (just of Bradman Avenue). Ride to Bli Bli, then coffee at La Petite Souris Patisserie, Alexandra Headland. Return to Denna Street through Sunshine Cove. Path will be a bit different to last time. Probably about 28-29 km. Slight inclines in Bli Bli and Maroochydore. Good morning riders. It seems that the weather will be kind to us tomorrow (Monday) so the ride will leave from Crummunda Park, Wurtulla at 7 am led by Rob. Coffee perhaps at Dicky Beach. Our ride for Monday 19th Feb will leave at 7am from The BBQ area at the Mooloolaba spit (opp fish on Parkyn). we will head through Mooloolaba, Mountain creek and Kawana. Leave near Maroochy Bridge Hotel (I think this used to be called Traders Duke Hotel) , 22 Denna Street Maroochydore (just of Bradman Avenue). Ride to Bli Bli, then coffee at La Petite Souris Patisserie, Alexandra Headland. This Patisserie has only been opened a few months. Return to Denna Street through Sunshine Cove. Probably about 28-30km, all tarred road or paths. Slight inclines in Bli Bli and Maroochydore. Second part will be slower with suburban streets and footpaths. Hello all. Judee is our ride leader for Monday 4th Feb and we will leave from Muller Park just on the northern side of Bli Bli bridge. Coffee will be at Curly's on the baordwalk, Mt Coolum. See you then for a 7am start. Greg and Heather will be leading the ride on the Australia Day public holiday, Monday 28th January 2019. The departure time is 7:00am from Fraser Park, 62-68 Landsborough Parade, Golden Beach, just north of Gemini Resort. Parking areas are along Landsborough Parade. We will ride 26 kms along quiet streets, bike paths and wetland areas in Pelican Waters (all flat). The public holiday means that many coffee shops will be closed. We will stop at a shaded park midway, where water is available, for a break. Those of you who need some sustenance should bring some snacks with you. A public toilet is available at the 22km mark. There are toilets, showers, BBQs, a beach on Pumicestone Passage and picnic facilities at Fraser Park. So, at the conclusion of the ride, you may wish to stay and have a swim and a picnic.